After announcing the date of possession of Bahria Sports City last week. Now, Bahria Town’s management has made another big announcement for all those have been waiting for years to get their files balloted. As it can be seen in above notification Bahria Town has announced the grand balloting date for each type of property of Bahria Town Karachi. The balloting will be held on 27th March 2018. For all those file owners who haven’t paid their due installments yet, they still have time to clear their dues as soon as possible, to get numbers in this up-coming balloting. The balloting will include 125 Sq yards, 200 Sq yards, 250 Sq yards commercial plots, and 125 Sq yards, 250 Sq yards, 500 Sq yards, 1000 Sq yards, 2000 Sq yards residential plots and 2 bed, 3 bed and 4 he’s apartments. All updated customers who have not been allotted their numbers to files have been catered for . 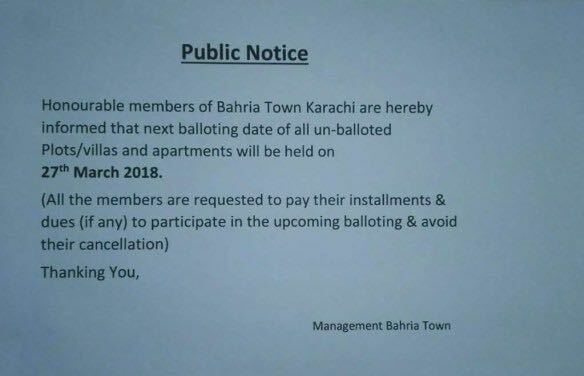 Bahria Town Karachi will hold the final balloting on 10th May 2018. In this balloting all the files will be included and nothing will be left unballoted if they have paid all dues. Before this bahria town has announced the balloting date in March 2018 but Unfortunately that balloting was postponed and now New date Balloting of Bahria Karachi 2018 is announced.